Building Description: The International Financial Centre (IFC) complex consists of two skyscrapers, the IFC Mall, and the 55-storey Four Seasons Hotel Hong Kong. 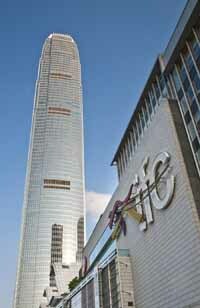 Two IFC was designed by world renowned architect Cesar Pelli; it is the tallest building on Hong Kong Island. Come and join some of Hong Kong’s (and the world’s) most well known companies at Two IFC including the Hong Kong Monetary Authority, UBS, Nomura, Blackstone Group and Ernst & Young. As one of the most iconic (and tallest) buildings in Asia together with easy access via train, ferry and the Hong Kong International Airport, Two IFC makes a fantastic address to use as an Asian base for your business.